Hi friend! I hope you had a magical weekend. We had a slight regression here in Saskatoon with some snow and a little bit of chilliness; however, I still firmly believe that Spring is on her way. And with that in mind it’s time to start cleaning out your system and supporting your body’s detoxification pathways with simple foods you can likely find in your pantry. This side dish is one of my staples and I typically eat it 3-5 times a week. You might be thinking “but Cait that’s so boring! How can you eat the same thing so often?” My response would fall along the lines of the rest of my diet is super varied AND you can literally change the flavour of this dish almost completely by changing the spices that you use. You could also top it with one of my sweet homemade vinaigrettes for an even more decadent dish. Anyhoo, back to the good stuff. 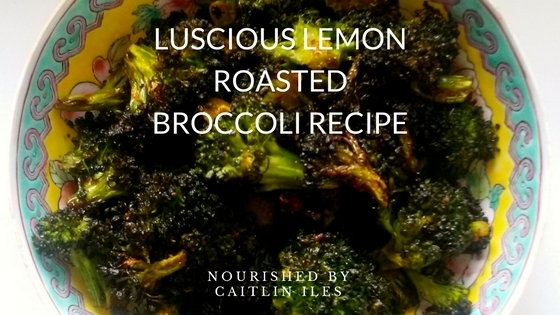 The two main ingredients in this dish (and really the only ones you need for the basic one in addition to a little sea salt) are both spectacular for supporting your body’s liver detoxification pathways and promoting overall good health. Broccoli, and other cruciferous veggies, contain sulfur compounds that help promote healthy liver detox and they contain a compound called indole-3-carbinol, which helps your body detoxify used up estrogens, ensuring proper hormonal balance. That being said, lemons are a great addition to the diet not only because of their vitamin C content, but because they help promote the production of liver enzymes thereby supporting your liver function. 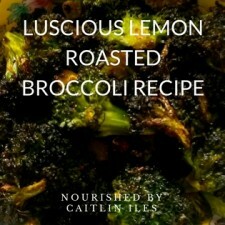 This recipe is the perfect side dish to any meal and combines delicious crispy broccoli with tangy lemon & garlic. Guaranteed to please even the pickiest eater! Optional: 1 tbsp. pumpkin seeds sunflower seeds, hemp hearts, or pine nuts. Spread broccoli onto an unbleached parchment paper lined baking sheet. Sprinkle with olive oil, smoked paprika, garlic powder, onion powder, and sea salt. Mix with hands until thoroughly coated then spread evening across the baking sheet once more. Check the broccoli. If edges are turned brown and crispy while middle is bright green, you're ready to go! If they're not quite there pop em back in for another 5 minutes. * Can sub half broccoli for half cauliflower or Brussels sprouts. Or use a combo of all three! Well there you are friend! My very favourite side dish recipe guaranteed to jazz up any meal. Sounds wonderful! Making this for supper tonight! Thanks, Caitlin!